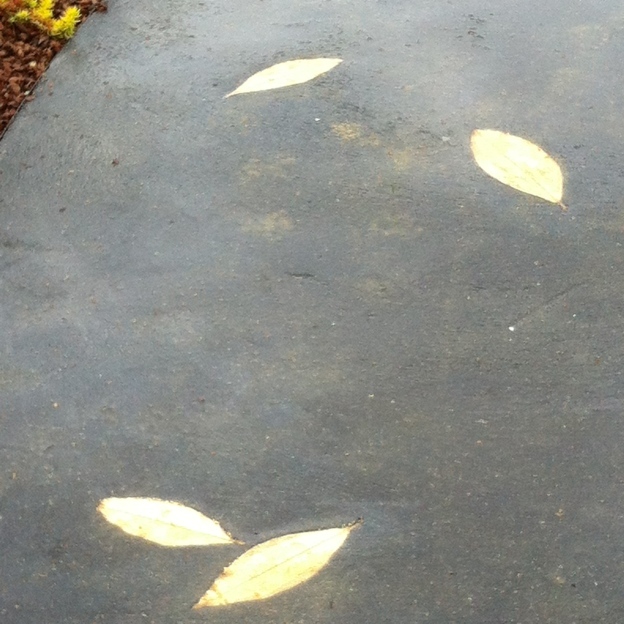 If you ever lusted for the Midas touch as your stocks plummet, gaze at these golden oak leaves on the barren pathway (left) that have fall from the branches of the dead gilded oak tree (below). 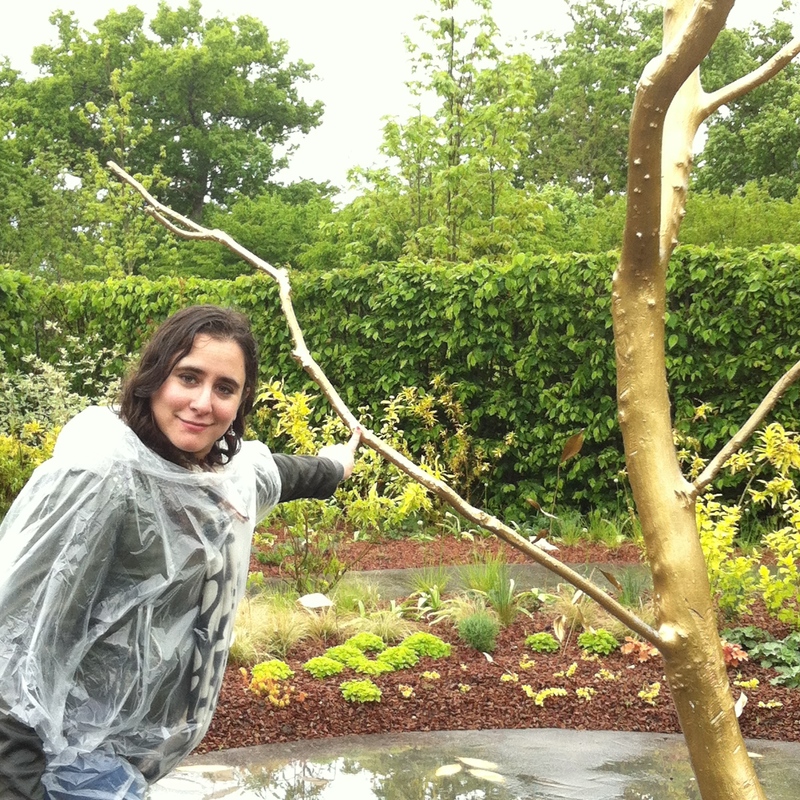 Inspired by Ovid’s cautionary tale in “Metamorphosis,” “LE TOUCHER D’OR” garden of greed is part of the 2014 International Garden Festival at chateau Chaumont sur-Loire that sadly closes next month. So much to learn about deadly sins! (This year’s theme; last weeks’s post was an homage to vanity.) 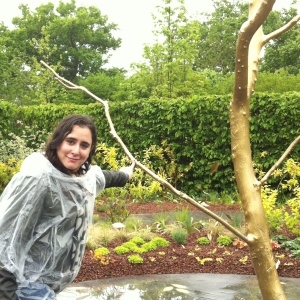 The jeune fille in the clear poncho is pointing out the dead gold tree in the rain – luckily Midas’ touch is no more or she would have become a statue too. Remember King Midas? According to myth, Dionysus, the god of wine, discovered his cherished mentor, the satyr Silensus, missing. In one version, townsfolk found a drunk and mumbling Silensus and brought him to the king. In another, Silensus passed out in the King’s rose garden. In both versions, Midas recognized the old drunk and treated him kindly. When Dionysus heard that Silenus was alive and well, he hurried to fetch his beloved old satyr and asked Midas what he could do for him. “Turn everything I touch to gold,” Midas reputedly said. 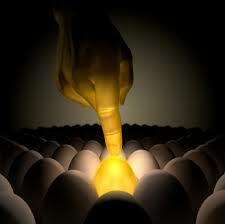 When Dionysus cautioned him to think about his request, Midas, the lover of everything gold, scoffed at his caution. So Midas touched a plant: it turned to gold. He touched food: gold. He touched a rose: gold. He touched water: gold. Soon, Midas was starving to death in wealth. Then, his beautiful daughter came running to greet her father. Too late to stop her, she became a gold statue. 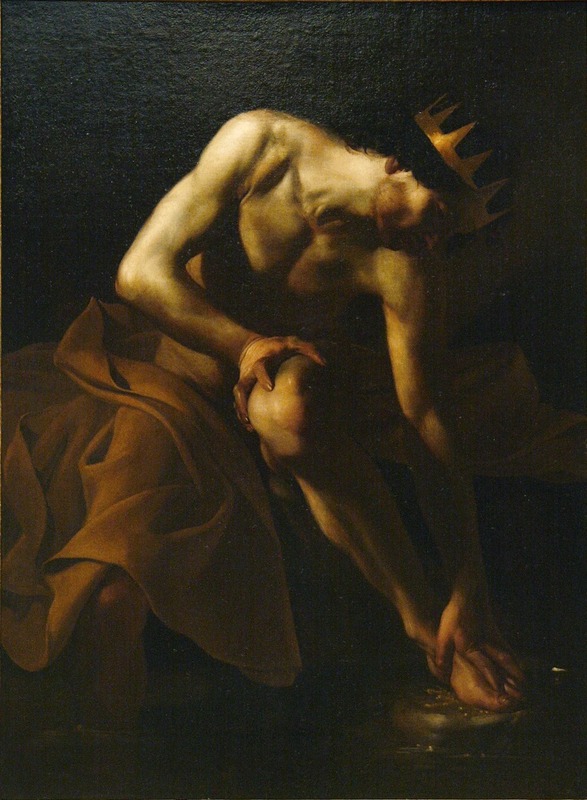 Panicked and starving, the king prayed and begged Dionysus to reverse his Midas touch. 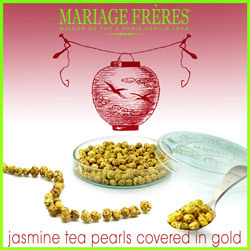 MARIAGE FRÈRES has sculpted these pearls from a costly green tea and then gently covered them, one by one, in fine gold, transforming them into shimmering gems and luminous drops-they do not just gleam, they glow. 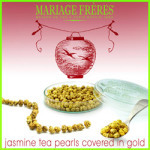 Steeped in a glass teacup, the pearls delicately infuse the liquor. 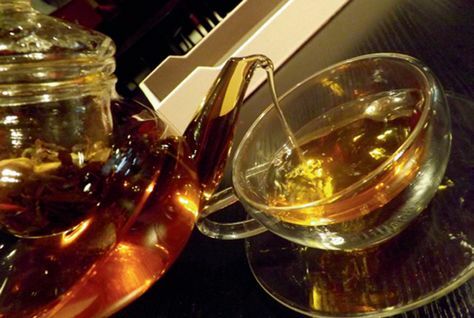 The tea dances with gold, a mandarin brew with golden highlights, while the palate is treated to dazzling notes of young growth and jasmine. Glass, however seems a rather plebeian vessel to drink such nectar. 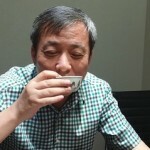 Why not try for your version of the cup chosen by 51 year old China billionaire and art collector Liu Yiqian. 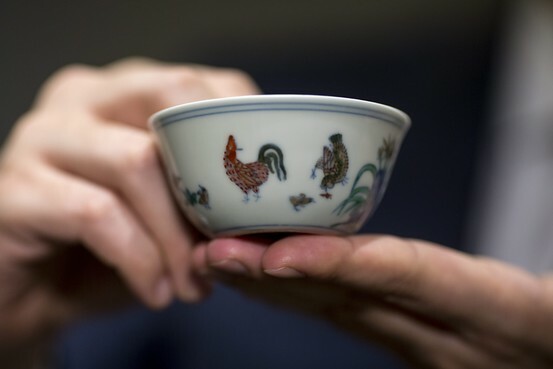 This past April, Mr. Liu successfully bid $36 million (that’s US dollars, folks), on a rare 500 year old Qing dynasty “chicken” tea cup at Sotheby’s. There are only 17 in existence, only 4 in private hands. Then there’s the 2013 Dubai caper, as reported by the Khaleej Times (see photo right): Seems that certain Dubai coffee shops were offering $62 dollar cups of bogus, inferior tea infused with “22K gold.” “These cafes do not mix gold with tea, but claim it in order to attract customers, and if they really do so, they cannot afford to mix except a small percentage, which is not something remarkable, which will not help rejuvenate human body,” Khalid Mohammed Sherif Al Awadhi, director of the food control department at Dubai Municipality, was quoted in Arabian Business.com. 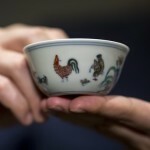 But lest you think that gold is only for greed, consider the curious tale of green tea, gold, and prostate cancer. 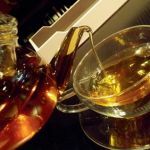 In 2012, researchers at the University of Missouri School of Medicine combined ECGC or epigallocatechin gallate (the famed antioxidant ECGC found in tea) with radioactive nanoparticles of gold to target tumors in the prostrate gland. When the combo was injected, tumors shrunk 80% over a course of treatment, according to an article published in Proceedings of the National Academy of Medicine. The usual treatment is chemotherapy, where healthy – as well as cancerous – area are destroyed as the chemo cocktail passes through the body. The EGCG/gold cocktail was much more effective: Not only did it target cancer cells, resulting in 80% of tumors shrinking, but only one or two injections were needed, as contrasted to numerous chemo treatments. 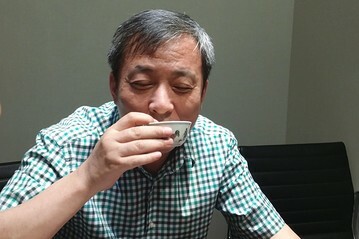 Killing cancer with golden tea? What would Dionysus have said?